The legitimacy of self-government rests on the consent of the governed. In our democratic republic, that consent is manifested through the administration of free and fair elections. But in 2016, our democratic process came under attack from a foreign state seeking to exercise power and influence in U.S. domestic politics. It’s possible that Russia believed that if it could interfere in the U.S. presidential election, it could change the course of American history. Protecting our elections is a matter of national security, requiring immediate action and coordination at all levels of government. In the lead-up to the 2016 general election, 33 states, along with 36 localities, requested assessment of their election systems by DHS.14 More requests have been made since November 2016.15 For its part, DHS has made clear, “[T]his is of the utmost urgency for the department and this government to ensure that we have better protections going forward.”16 Election officials and politicians at the local, state, and federal levels have a critical role to play. Require voter-verified paper ballots or records for every vote cast. Conduct robust postelection audits to confirm election outcomes. Update and secure outdated voter registration systems and e-poll books. Require minimum cybersecurity standards for voter registration systems and other pieces of voting infrastructure. Perform mandatory pre-election testing on all voting machines, as well as continuous vulnerability analysis. Expand threat information sharing, including comprehensive threat assessments accompanied by mandatory reporting requirements. Elevate coordination between states and federal agencies on election security, including real-time notification of security breaches and threats. Provide federal funding for updating election infrastructure. Paper-ballot optical scan systems have been shown to be more cost effective than electronic voting machines.35 In 2008, SAVE our Votes—a Maryland-based advocacy group for secure, accessible, and verifiable elections—conducted a cost analysis of Maryland’s decision to convert from a paper-based system to electronic voting machine touch screens in 2004.36 The study found that by 2008, the cost of conducting elections increased tenfold compared with only seven years prior. A number of counties that previously used optical scan systems saw their voting equipment costs skyrocket by an average of 179 percent per voter after switching to electronic touch screens.37 Maryland has since returned to a paper-ballot system.38 Voting systems that use electronic machines are costlier because they require more equipment. Each precinct, for example, requires several electronic voting machines to ensure that polling places can accommodate multiple voters at once. In contrast, paper-ballot voting systems require as few as one optical scanner and one ballot-marking station per precinct to assist voters with disabilities or language barriers. Additionally, many states allow voters to submit completed absentee ballots over the internet—via email, fax, or web portal—where there is no way for voters to confirm that the vote they cast is the same as that recorded by the county clerk’s office. While most states only allow online voting for military personnel and U.S. citizens living abroad, states such as Alaska allow online voting for all absentee voters.39 The Department of Homeland Security’s Cyber Security Division “does not recommend the adoption of online voting for elections at any level of government at this time,” due to concerns over voter confidentiality and the potential for vote manipulation by malicious actors.40 One solution going forward is to require that all absentee ballots be returned by mail. Given these facts, postelection audits—which are robust enough to create strong evidence that the outcome is accurate and to correct it if it is wrong—must be conducted after every election. Importantly, election officials must be given enough time between the closing of the polls and the certification of official election results to conduct a thorough audit. “Risk-limiting” audits increase the efficiency of the auditing process by testing only the number of ballots needed to determine the accuracy of election outcomes.67 Risk-limiting audits generally proceed by selecting an initial sample of ballots and interpreting them by hand, then determining whether the audit must expand.68 The number of ballots in the initial sample depends on various things, including the margin of victory in the contest.69 Elections with wide margins of victory require testing fewer ballots, while races with close margins of victory require more ballots to be tested because there is less room for error.70 Colorado is about to become the first state to regularly conduct risk-limiting audits after elections.71 As described by Dwight Shellman, the Colorado elections office’s county support manager, “If a voting system has been maliciously altered in some way, [this audit] should give the public great assurance that we are going to know that, and we will adjust the result accordingly.”72 Risk-limiting audits offer election administrators an effective and efficient way to test the accuracy of their elections without breaking the bank. The threat to voter registration systems is real. According to a DHS memo obtained by CNN, the department observed “Russian cyber actors attempting to access voter registration databases prior to the 2016 elections.”76 In August 2016, the Russian government targeted a company specializing in voter registration software, VR Systems, as part of a plan to “launch a voter registration-themed spear-phishing campaign targeting U.S. local government organizations,” according to National Security Agency documents obtained by The Intercept.77 On at least one occasion, hackers installed malware on the computer of an Arizona county election official, giving hackers access to login information that could be used to breach county voter registration databases.78 Twenty-one counties in North Carolina use software produced by VR Systems, including Durham County, which experienced the malfunction of laptops used to confirm voter registrations across multiple precincts last year, though local officials maintain that the problem was unrelated to Russian hacking.79 In order to ensure the accuracy and accessibility of voter registration lists during voting periods, states should establish paper-based contingency plans during early voting and on Election Day in case of system failures or hacks. For example, each local polling place should have paper copies of its voter registration lists on hand that can be consulted throughout the voting process. There were nearly 150,000 attempts to penetrate South Carolina’s voter registration database on Election Day last year. Some state officials are already taking affirmative steps to establish minimum cybersecurity standards to protect state systems and databases. For example, many states already have some form of cybersecurity incident and disruption response plan in place to protect against and respond to cyberthreats.100 In addition, this past July, the National Governors Association, led by Virginia Gov. Terry McAuliffe (D), announced that 38 governors from across the country entered into “A Compact to Improve State Cybersecurity.”101 As part of the compact, states commit to “[d]eveloping a statewide cybersecurity strategy that emphasizes protecting the state’s IT networks, defending critical infrastructure, building the cybersecurity workforce and enhancing private partnerships.”102 States further agree to “[c]onducting a risk assessment to identify cyber vulnerabilities, cyber threats, potential consequences of cyberattacks and resources available to mitigate such threats and consequences,” among other things.103 These efforts are a strong start, but further steps are needed to include a plan of action carefully tailored to the unique traits of voting infrastructure. States should conduct mandatory pre-election tests on all voting machines to ensure that they are in good working order before a single vote is cast. Most states already have laws in place requiring state officials to test voting machines and equipment in the weeks and months leading up to an election, though their scope varies depending on the jurisdiction.104 Some states require that all voting machines be tested, while others permit the testing of a small sampling of machines.105 And while pre-election testing may be required, it is not always carried out in practice. Admittedly, pre-election testing is not foolproof and can be manipulated, particularly by sophisticated actors.106 That being said, pre-election testing remains an important step that states can take to mitigate machine-related problems on Election Day and protect the reliability of election outcomes. Testing should be conducted on all election machines and equipment, including e-poll books, on multiple occasions prior to the start of early voting and Election Day. Testing should be carried out with appropriate public notice and in a public forum in an effort to increase transparency and public confidence in the electoral process. Critically, testing must be completed with enough time to allow for effective remediation. Any abnormalities should be reported immediately to officials overseeing election administration and security, and they should be shared between states, localities, and federal agencies to alert other election administrators to potential threats. Additionally, in order to understand the full extent of election-related risk, vulnerability analysis should be carried out continuously on all election machines and voter registration databases.107 In the words of Sen. Ron Wyden (D-OR), “We obviously need to know about vulnerabilities, so that we can find solutions.”108 Vulnerability analysis of election infrastructure should be mandated by state and federal law and should include regular system penetration testing and vulnerability scans. Once conducted, states will be better positioned to assess where government resources should be allocated and plan for preventative measures and strategies. Vulnerability analysis should be carried out by qualified, impartial professionals, rather than election equipment vendors or election administrators, who may have an interest in minimizing shortcomings in election machines and downplaying election vulnerabilities. States too can conduct regular vulnerability assessments on their election infrastructure. Some states—including Maryland and Washington—have employed their Air National Guard to conduct cybersecurity testing on public networks.109 In 2016, the Ohio National Guard took part in defending the state’s elections systems by running penetration tests to detect vulnerabilities and searching for evidence of malicious activity.110 Other states, including Ohio and Virginia, have reportedly carried out security assessments on their voter registration databases, costing an estimated $25,000 and $40,000, respectively—a fraction of their annual budgets.111 Regular, automated scans should be conducted on voter registration databases to detect suspicious activity as soon as it occurs. Suspicious findings should be reported immediately to federal agencies and to other state and local election officials around the country. The federal government could incentivize such analysis via grant programs, including those that exist at DHS, and Congress should explore whether such programs are sufficiently flexible and resourced to support these efforts. The U.S. intelligence community is best equipped to carry out threat assessments, as it has the personnel and resources necessary to thoroughly probe and analyze complex election databases, machines, and cyber vulnerabilities.117 In carrying out these assessments, federal officers must work closely with state officials who are more familiar with the intricacies of their unique systems. State officials who have appropriate security clearances should also be provided with regular classified briefings on cybersecurity threats and system vulnerabilities.118 All federal agencies responsible for conducting election infrastructure threat assessments should be required to submit biannual reports—classified and unclassified—to Congress on their findings, as a means of educating lawmakers and the public on threats and making recommendations for best practices.119 In addition, Congress should receive swift notification of any intelligence concluding that there have been cyberattacks or intrusions on our election system, or evidence that a foreign adversary has sought to interfere in our democracy. A “critical infrastructure” designation comes with benefits for election administrators, including priority status for requests submitted to DHS, domestic and international cybersecurity protections provided by federal agencies, and access to the Multi-State Information Sharing and Analysis Center (MS-ISAC).122 MS-ISAC facilitates and provides avenues for information sharing between states and DHS, furthering the ability of states to prevent and respond to cyberattacks.123 According to DHS, the department is already holding biweekly teleconferences with “all relevant election officials,” which is a promising start.124 However, DHS should be held accountable for specifying comprehensive, specific steps it will undertake to support this designation.125 This may include determining whether MS-ISAC support is sufficient to meet the task or whether a more focused effort, such as the establishment of an election-focused information sharing hub, should take place. Coordinated partnership between levels of government—especially as related to voting and elections—has not always been conducted in the most efficient or effective manner. For example, some state officials voiced frustration after first learning that their state may have been one of those targeted by Russian operatives during the 2016 elections through testimony given recently by DHS officials before Congress.129 There is room for improvement in identifying, promoting, and exercising channels for communicating key information. The See Something, Say Something campaign or the Nationwide Suspicious Activity Reporting Initiative may offer guidance to set up public education campaigns in the context of election security.130 The private sector also has a role to play. Election vendors, for example, should be required to provide notice to states in the event that their systems are hacked, in order to prevent potential problems from arising during elections. The role of federal agencies in protecting election security does not constitute a federal takeover of election administration. As aptly described by Sen. King of Maine, “[N]obody’s talking about a federal takeover of local election systems or the federal rules. What we’re talking about is technical assistance in information and perhaps some funding, at some point.”131 By designating election systems as critical infrastructure, coordination between stakeholders has the potential to be improved, but it will depend on sustained pressure and engagement by concerned stakeholders. Updating outdated election infrastructure, conducting mandatory audits, and putting in place minimum cybersecurity standards and testing is essential and requires resources. Some estimates suggest the nationwide cost of updating outdated voting machines to be upward of $1 billion, while the cost of replacing the country’s paperless machines is between $130 million and $400 million.132 At the same time, the national cost of conducting threat assessments for voter registration databases is estimated to be between $1 million and $5 million annually, with nationwide risk-limiting audits for federal elections costing less than $20 million per year, according to some evaluations.133 According to one study conducted by the Brennan Center for Justice, of the 274 election officials surveyed in 28 states, more than half said that they will need new voting machines by 2020.134 Unfortunately, 80 percent of those officials said they “did not have all the necessary funds.”135 State and local election administrators cannot, and should not, be expected to independently foot the bill on these protective measures. It is the responsibility of Congress to defend American interests and ensure that our elections, which are central to a functioning democracy, are free, fair, and secure. The federal government and Congress have a duty to allocate funding and assist in the implementation of measures to guard against disruptions in future elections, at the very least in federal elections. 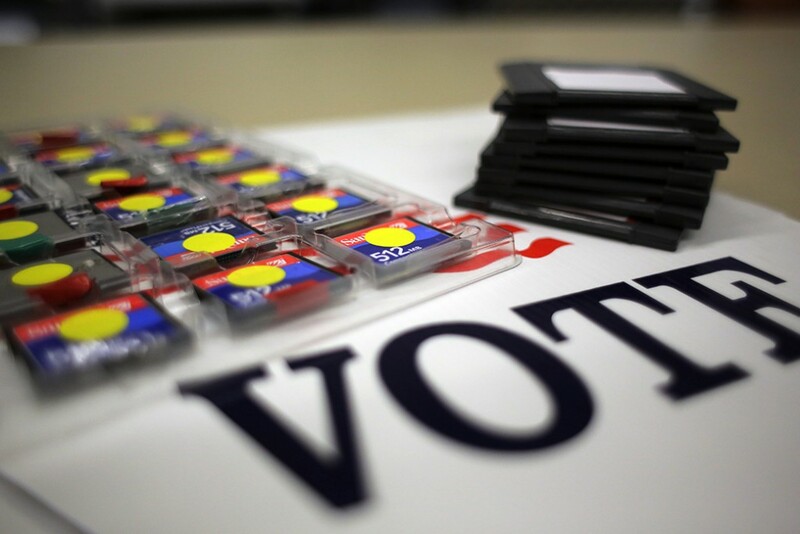 In addition to offsetting the cost burdens on state, county, and municipal election administrators—many of whom simply cannot afford to update and secure election machines and databases—federal funding can stem inequity resulting from uneven municipal operating budgets. When state and local jurisdictions are held solely responsible for purchasing new voting machines or providing other updates to their election systems, it is often the case that richer, majority white communities receive newer, more reliable machines and upgraded security measures.141 Conversely, poorer communities and communities of color are left with inadequate machines and cyber protections that can lead to a higher likelihood that they may not be able to exercise their right to vote as a result of malfunctioning and easily hacked voting machines or election databases.142 The allocation of federal funds can therefore counterbalance the unequal distribution of state and local resources to ensure that funding goes where it is most needed and to help guarantee that all Americans who are eligible to vote are able to participate in the electoral process using secure and reliable systems. As it currently exists, America’s election infrastructure is dangerously insecure and susceptible to hacking, machine malfunctioning, and Election Day disruption. In 2016, Russia exhibited both the skill and determination to cause problems and sow distrust in U.S. electoral processes and outcomes. It is safe to assume that Russia is right now strategizing its next plan of attack, honing its abilities to infiltrate sensitive state and federal election machines and databases without detection and to maximum effect. As Sen. Burr warned, “This adversary is determined. They’re aggressive and they’re getting more sophisticated by the day.”143 Failure to put in place measures and provide funding to protect election infrastructure is the height of political negligence. It is critical that we begin building our defenses to protect against election intrusions before it is too late. The future of our democracy depends on immediate action by government officials and election administrators at all levels to update and safeguard America’s election systems and processes. Danielle Root is the voting rights manager for Democracy and Government at the Center for American Progress. Liz Kennedy is the director of Democracy and Government Reform at the Center. The authors would like to thank Marian Schneider, Moira Whelan, Susannah Goodman, and Patrick Barry for their contributions to this issue brief.